Google Now, one of the key features of Google Android OS is getting a huge upgrade and it promises to make Now Cards central to your Android Smartphone experience. Google Now till date was a virtual assistant that gave you byte sized information through Now Cards. Navigation, Weather, News Updates, Sports updates, Flight status etc were some of the most used Google Now cards. Most Android users will vouch that Google Now has been quite helpful for them even in its current form. But the new update is going much beyond and has now integrated with over 40 useful third party apps that will help Android users in many different ways. Apart from these, the new Google Now will provide information on Relevant website information, Car rental, flight boarding pass, upcoming TV shows, restaurant reservations, Birthday’s events, stock updates, package tracking, places, nearby events and lot more. Check out all the third party integrations that are available with new update here. It is interesting to note that Google Now is going beyond being just a intelligent virtual assistant, it is now becoming a bridge between the apps that you use frequently, and provide you with notifications from these apps that are relevant and important to you. Currently Google has teamed with over 30 developers and they plan to expand the features over time. The new update is being rolled out in a phased manner and some of you should get this update shortly. 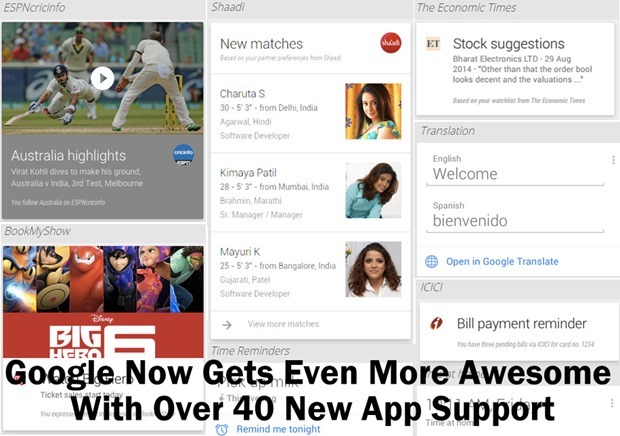 Do give it a try and let us know how you like the new Google Now!